BANGI, 31 Aug 2012 – Over 2000 participants and visitors flock the Chancellor Tun Abdul Razak Hall (DECTAR) of The National University of Malaysia (UKM) here to celebrate the eve of independence. They include UKM students who are members of the military and police corps resplendant in their uniforms, doctors and nurses and others in their ethnic traditional dresses. Among them were 65 children of the original inhabitants of the area where the UKM campus now stands who were invited to join in the festivities as special guests of UKM. Their parents had to be relocated to a nearby area which is now known as Kampung Bukit Bunga to make way for the establishment of UKM about 42 years ago. With the concept of 1 Malaysia, the orang asli children and other ethnic groups representing Malaysia had gathered together to be entertained by patriotic songs and cultural dances while waiting for the midnight hour. 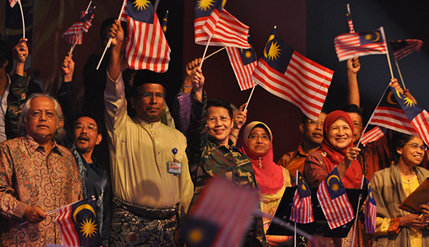 At exactly twelve midnight, the Malaysian flag was raised in the Hall on a portable flag pole and the ceremony ended with bursts of confetti in the Hall. At a forum earlier Distinguish Professor Datuk Dr Shamsul Amri Baharuddin said while many nations in the world are stuck in violent conflicts, Malaysians know too well about the cost of conflicts and were always able to prevent them from degenarating into violence. The Director of The Institute of Ethnic Studies (KITA) of UKM said conficts are always present in the country but rarely escalated into violent clashes. Prof Shamsul said the dissatisfactions and perceived conflicts are always discussed within each community and often times debated between the races but they rarely escalate into violent clashes. This was because the people are always mindful of events occuring after independence, one of which was the racial riots of May 13th 1969. He said conflicts always exist because there are different points of view among the various races on how an independent Malaysia should be. He said remembering independence day through gatherings with the chanting of ‘Merdeka’ is good and well, because it allows people to express themselves. Malaysians, he said, value their independence every single day and not just on the 31st of August by refusing to resort to violence amidst disagreements and dissatisfactions. Retired army general, Dato’ Seri Zaini bin Hj Mohd Said responsible for securing the surrender of the Al Maunah group that staged an arms heist at an army camp as part of a bid to topple the government, said that threats to security has expanded beyond the control of the military. The threat to the country’s peace and stability has evolved through the years since Independence where threats can happen through various means. During the early years of independence you know who your enemy is and thus know what you are up against. But today the nation’s stability can be threatened from many areas including education and the economy, he said. Conflicts, poverty, hunger, water scarcity and pollution among other human sustainability threats continue to be some of the more pressing topics placed at the top of the global agenda at the dawn of the 21st century. Risks from these threats could escalate if the development of the country is hindered. Thus ensuring peace and stability is no longer just the preserve of the military but is now the responsibility of everyone, he said. While there are external elements which try to exploit any perception of injustice in the country to forment a full blown conflict, the country’s stability can still be maintained so long as Malaysians remain a mature society and be mindful of the cost of conflicts. A violent conflict would take away the most important ingredient of independence, freedom, Gen Zaini said. UKM Vice Chancellor, Prof Tan Sri Dato Wira Dr Sharifah Hapsah Syed Hassan Shahabudin, deans of faculty, lecturers and students attended the event.